Slough Grass is a hardy grass that will happily grow in any wet soil. It is usually found near water and is common haymaking material or forage. 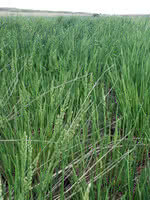 Slough Grass is also useful for erosion control and land reclamation.